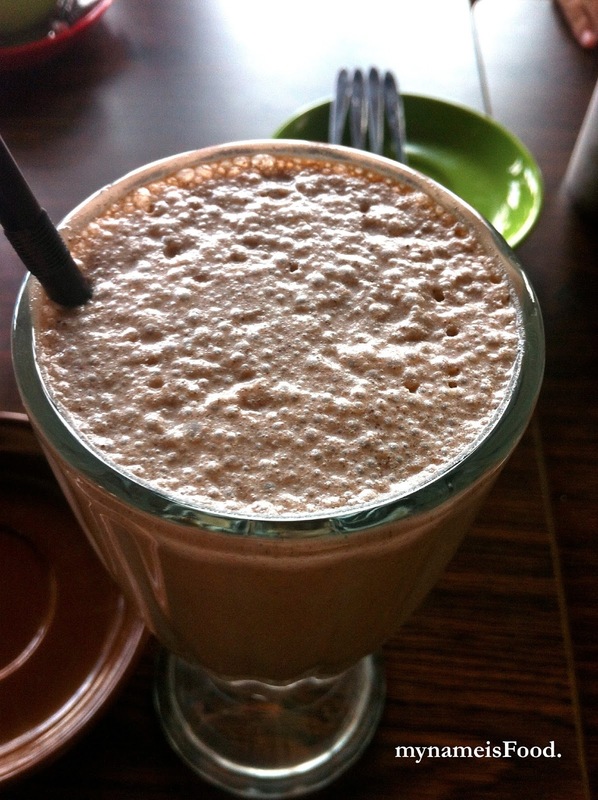 Coco Jungle Chocolate Lounge, Sunnybank, Brisbane - my name is Food. Second dish ordered was their 'Belgian Waffle' which was offered either for One ($14) or for Two ($18)..
Toasted Belgian Waffles served with sliced strawberries and banana, served with classic hot chocolate sauce and ice cream.. Add extra cream for a buck, but without cream itself was already alot... Waffles was nice and had the waffley texture, as the way it should and was not soggy... the bananas and strawberries was reasonably given.. I ordered an 'Oreo chocshake' ($7), quite pricey compared to the other milkshakes you would find around here, but worth a try and I was into an Oreo mood so hey, why not... It sure had that oreo taste, obviously, but I would have preferred it to have abit more crunchiness of the oreo biscuit.. Am not sure whether they just blended it all until all of the oreo pieces had just crushed away into teeny little itty bitty bits.. But overall, it was good.. the balance of their chocolate, milk and oreo was balanced well..
'Coco Jungle Fondue' is offered for One ($14) and Two ($18). Both consists of Belgian milk chocolate melted and served with a selection of fresh fruit, marshmallows, banana, bread and dutch pancakes. If you would prefer white chocolate or dark chocolate and extra buck is needed.. The dutch pancakes was definitely cute and sweet and they were all dusted with icing sugar to give it that look. I think the presentation was neat and nice.. It might look little to some but it was definitely alot for us until we couldn't even finish it all off.. The selection of fruits included the basics of strawberries and banana and the bread was simply a banana bread and the marshmallows was also nice and chewy. The dutch pancakes were definitely the winner out of all of the condiments in the fondue, maybe it's because nowadays, you can get that dutch pancake maker but you can't seem to be able to find a dessert place where they sell dutch pancakes, not many anyway..